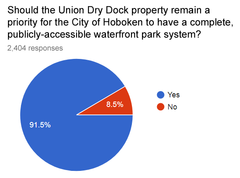 The City of Hoboken received 2,447 responses to an online survey regarding the future use of the former Union Dry Dock property - the largest response to any public survey issued by the City. Based on this public feedback, the City will continue the process of acquisition of the Union Dry Dock site by initiating good faith discussions with the property owner. 73.8% (1,807): A public open space and waterfront walkway with no industrial uses. This option would be paid for by the City of Hoboken at a potential acquisition, design, and construction cost of tens of millions of dollars. Funding sources may include the Hoboken Open Space Trust Fund, County Open Space Trust Fund, and NJ Environmental Infrastructure Trust low-interest loans, among other sources. 13.5% (331): A ferry maintenance and refueling facility with a public open space on top of a ferry maintenance facility, with an inland walkway next to Sinatra Drive. This option would be paid for mostly or complete by NY Waterway. 8.1% (198): A ferry maintenance and refueling facility with pocket parks at the north and south ends of the property, with an inland walkway next to Sinatra Drive. This option would be paid for mostly or complete by NY Waterway.